This article is about the year 1696. 1696 (MDCXCVI) was a leap year starting on Sunday of the Gregorian calendar and a leap year starting on Wednesday of the Julian calendar, the 1696th year of the Common Era (CE) and Anno Domini (AD) designations, the 696th year of the 2nd millennium, the 96th year of the 17th century, and the 7th year of the 1690s decade. As of the start of 1696, the Gregorian calendar was 10 days ahead of the Julian calendar, which remained in localized use until 1923. Wikimedia Commons has media related to 1696. 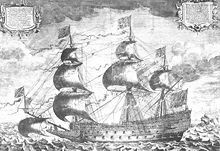 January 27: HMS Sovereign of the Seas accidentally burns. Great Recoinage of 1696: The Parliament of England passes the Recoinage Act. Colley Cibber's play Love's Last Shift is first performed at the Theatre Royal, Drury Lane in London, England. January 27 – In England, the ship HMS Royal Sovereign (formerly HMS Sovereign of the Seas, 1638) catches fire and burns at Chatham, after 57 years of service. January 29 (O.S.) – Peter the Great becomes sole tsar of Russia, upon the death of Tsar Ivan V.
January 31 – In the Netherlands, undertakers revolt after funeral reforms in Amsterdam. March 7 – King William III of England departs from the Netherlands. April – Fire destroys the Gra Bet(or Left Quarter) of Gondar, the capital of Ethiopia. May 31 – John Salomonsz is elected chief of Sint Eustatius, in the Caribbean Netherlands. July 18 – The fleet of Tsar Peter The Great occupies Azov at the mouth of the Don River. July 29 – King Louis XIV of France and Victor Amadeus, Duke of Savoy, sign a peace treaty. August 13 – The Dutch state of Drenthe makes William III of Orange its Stadtholder. August 22 – Forces of the Republic of Venice and the Ottoman Empire clash near Andros. November 21 – John Vanbrugh's play The Relapse, or Virtue in Danger is first performed at the Theatre Royal, Drury Lane in London. December 7 – Connecticut Route 108, one of Connecticut's oldest highways is laid-out to Trumbull. December 19 – Jean-Francois Regnard's "Le Joueur" premieres in Paris. December 24 – The Inquisition burns a number of Marrano Jews in Évora, Portugal. Pierre Le Moyne d'Iberville captures and destroys St. John's, Newfoundland. Polish replaces Ruthenian, as an official language of the Grand Duchy of Lithuania. A famine wipes out almost a third of the population of Finland, and a fifth of the population of Estonia. William Penn offers an elaborate plan for intercolonial cooperation largely in trade, defense, and criminal matters. The Second Pueblo Revolt occurs. Edward Lloyd (coffeehouse owner) probably begins publication of Lloyd's News, a predecessor of Lloyd's List, in London. ^ Schiavone, Michael J. (2009). Dictionary of Maltese Biographies Vol. II G-Z. Pietà: Pubblikazzjonijiet Indipendenza. p. 1711. ISBN 9789993291329.